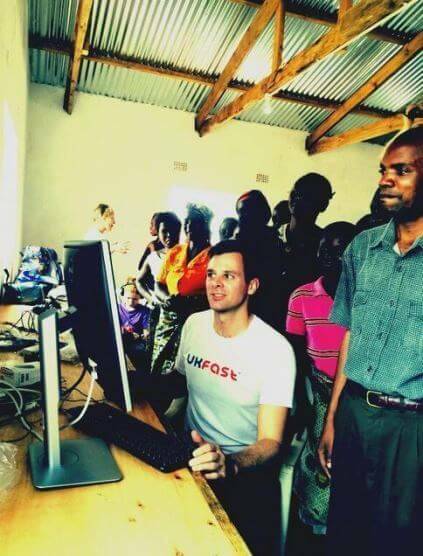 One of our fab texperts Tyson is out in Malawi right now, helping to create a technical suite at The Kasupe Project, Chigonere Village. This will see five Raspberry Pi computers for the primary school that Kasupe has opened in the rural village; bringing internet access, tech education and providing a revenue stream to make a lasting impact. We’ll be updating this blog post as we hear more from him so come back each day for the latest news on how the team are doing! Yesterday was really special, we went to Chigonere where the project is based and participated in the village meeting with their regional leader. Called ‘District Council’, this leader then speaks directly to the government and their MP. After the meeting we got stuck in and unpacked and set up one of the Pi-s for them to see! They were mesmerised by what I was saying while we waited for the inverter to be set up to provide AC power from the DC solar panels. I prompted them for any questions and the Village Group Head Chief, a level above the Village Chief (there were a lot of official people there! ), responded by saying how could they have questions when they have never seen a computer before!?! The solar power was promptly sorted and I gave them a whirlwind tour of the OS and various applications they could use for the school’s curriculum. Again, they were glued to my every move! When it came to the Minecraft demo, I brought in the experts… Tim’s 9 year old son! The whole room was dumbfounded that this child could whizz around the computer and Minecraft game so well! But I think it opened their eyes that you didn’t need to be UK computer expert (which is how they saw me) to be good with computers. Here’s a picture I tweeted yesterday, with me doing the demo, and today we meet the teachers! Thanks for the update Tyson – it’s amazing to hear what you’re up to over there and how the Kasupe Project is coming along! Keep your eyes peeled for more updates from Tyson and the gang! Yesterday was all about the teachers. We did 2x three hour sessions with them (which is longer than their school day!) going over some of the basics of how to log on and log off, reboot if they freeze up, and shutdown at the end of the day. We showed them how to hold the mouse and where to find applications to run once they’ve logged on. They all wanted to know how to create documents so we showed them how to open LibreOffice Writer and type their name and head teacher’s name. They all loved this – seeing their name as a creation on the computer that they created really got them excited! This may seem like an extremely remedial task and one that would take anyone at UKFast only a few moments to complete, but that took us the whole first three hour session – partly because they didn’t know where any of the keyboard keys were as none had ever seen a keyboard before! And we had about 20 teachers and only 5x Raspberry Pi computers so it took extra time to swapped each other around to ensure everyone had a go. The other thing was while the computers are for the Kasupe Primary School Center, the session was open to all teachers in the three village area that makes up the village group. So we had teachers from the local ‘community day secondary school’ and another primary school. This turn out was unheard as it was an unpaid event and the teachers gave their entire day for further development. The picture I tweeted yesterday was with me and the secondary school head teacher working with the LibreOffice application. We’ll bring more back with us on our return. Wow, what an amazing day! And today we get to start working with the students! Yesterday we worked with students! It was great to show them around the OS, how to use the keyboard and the mouse, how to open applications, and all sorts. We focused on showing them LibreOffice Writer and Sheets for document / office skills, Scratch for programming (which they really struggled with because it requires a high level of computer navigation skills around the user interface), and Minecraft for mouse and keyboard skills (they loved it but didn’t really get it as it was so foreign to them). All in all it was short but great to work the primary target of the project! And today is very exciting as the district council official is so excited about what we are doing he is bring the national TV station crew out to the village to film what’s going on! So tune in to TV Malawi later to say (and I’ll do best to to get a copy of the recording for us! ).